Dave’s alarm clock blares its obnoxious buzzing sound. It’s 4:30 am on the first day of school. Dave won’t be cramming a backpack with school books, but he will pack a lunch like most of the other people on the bus. Dave isn’t going to school to learn. He’s going to drop children off at the side entrance because he’s a school bus driver. The bus barn is quiet when Dave arrives at 5:45 am. Dave goes into the office to retrieve the key to bus number 201, his usual vehicle on morning runs. As he pulls away, he thinks about his decision to leave the regional transportation agency. The fights he has to break up on a school bus are nothing compared to the ones he saw on the routes he used to drive. Once Dave is plodding along his normal route, he stops every 10 or so blocks to allow a handful of children onto the bus. He waves at parents as he slows to a halt. He has names for a few of them—bathrobe lady, giant coffee mug guy. Dave keeps a watchful eye on the road. Anything can happen, and he has to be prepared for it. The lives of the children on and near his bus are in his hands. As he and his load of children near the school’s side entrance, the children get louder. They’re usually pretty well-behaved in the morning. It’s the afternoon where he has to crack the whip. Despite the occasional discipline problem he has to report to a teacher or principal, Dave’s runs are uneventful. A bus driving job can be very fulfilling. Bus drivers for government transportation agencies get to meet new people every day and have the opportunity to develop friendly relationships with regular passengers. School bus drivers have the opportunity to positively impact the lives of children. Unless government transportation agencies contract with bus operating companies, bus drivers are hired through the normal government hiring process. Individuals seeking employment as a bus driver complete job applications when vacant positions are posted. Hiring managers review all applications and select the most qualified handful of applicants to interview for the position. Most often, individuals need a high school diploma to qualify for bus driver positions. A college degree is rarely required. More importantly, applicants need the appropriate driver’s license. All bus drivers must have a commercial driver’s license. The driver’s license a 16-year-old gets so he can cruise around town is not sufficient. The CDL is something completely separate. Not only do bus drivers need a CDL, but they also need specific endorsements on the CDL. All bus drivers need a passenger endorsement, and school bus drivers also need a school bus endorsement. Holding a valid CDL with the proper endorsements should be enough to land a bus driver job. When many applicants apply to a position, professional experience driving a bus can put an applicant toward the top of the list of interviewees. With the primary objective of safe travel, bus drivers transport people from one place to another usually along predetermined routes. School bus drivers do this exclusively for children. Some transportation agencies offer door-to-door transportation service, but it is usually limited to the elderly and individuals with disabilities. To ensure safe travel, bus drivers must operate their vehicles with great care. They must also ensure that passengers are safe from harm from within the bus. Unruly behavior by passengers cannot be tolerated because it puts others at risk of harm either directly or by causing distraction for the driver. Drug and alcohol use while on duty is strictly forbidden. Not only can it get a bus driver fired, it can get a bus driver arrested and CDL suspended. A driver with a suspended CDL cannot legally operate a bus. More than half of all bus drivers work a full-time schedule. Some school bus drivers take on other duties for the school district between morning and afternoon runs. Some districts have staggered starting and ending times for their schools. Bus drivers in districts with this scheduling can make more than one run each morning and afternoon. According to 2012 data from the US Bureau of Labor Statistics, bus drivers earn a median wage of $29,550 per year. 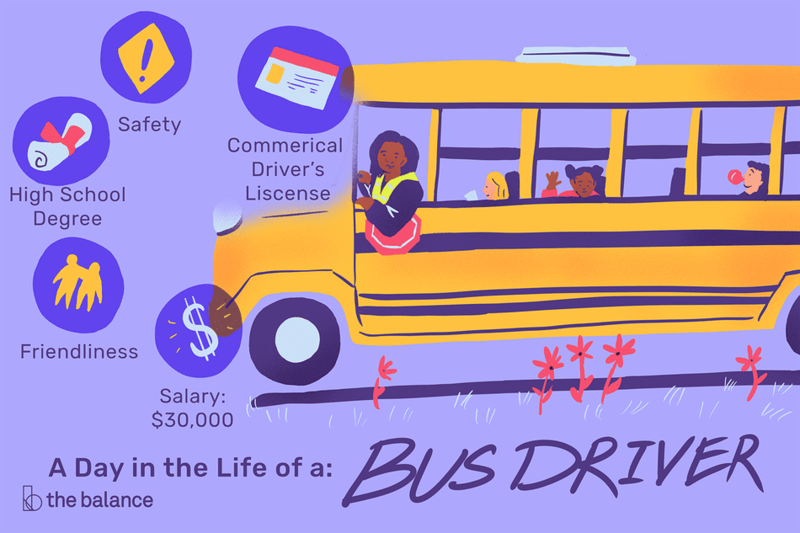 School bus drivers earn a median wage of $30,000 per year.